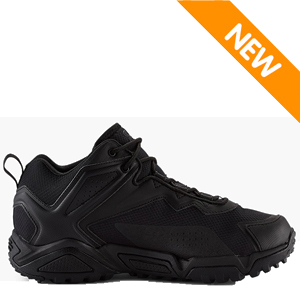 The Under Armour 1254924 Men’s UA Tabor Ridge Low Tactical Shoe offers much of the same comfort and performance in full and mid height tactical boots, with the profile of an ankle height athletic shoe. This boot was designed for comfort and includes a highly breathable mesh upper and overlays for superior ventilation and air flow while staying lightweight. A durable EVA midsole keeps this shoe light and offers excellent shock attenuation during physical activities such as running and jumping. A lightweight polyurethane footbed wicks moisture and provides additional comfort fit. A four inch height maximizes freedom of movement for those that don't require the ankle support of a mid or full height boot.